Kiev, Ukraine – Ukraine’s President Petro Poroshenko has urged NATO to deploy warships to the Sea of Azov following a military standoff in the area between Russia and Ukraine. Poroshenko’s remarks, part of a concerted push by Kiev at gaining Western support for more sanctions against Russia, were published in an interview with German newspaper, Bild, on Thursday. In a sharp response, Kremlin spokesperson Dmitry Peskov said the comment was “clearly aimed at provoking further tensions” and driven by Poroshenko’s “electoral and domestic policy motives”. Accusing Russian President Vladimir Putin of wanting “the old Russian empire back”, Poroshenko said: “The only language he understands is the unity of the Western world”. “Crimea, Donbass, the whole country. As Russian tsar, as he sees himself, his empire cannot function without Ukraine. He sees us as his colony,” he said. In response, German Chancellor Angela Merkel on Thursday called on Kiev “to be sensible” and said there was no military solution to the dispute. Світ повинен говорити в один голос. Ми повинні негайно запровадити додаткові санкції в умовах ймовірної російської агресії. 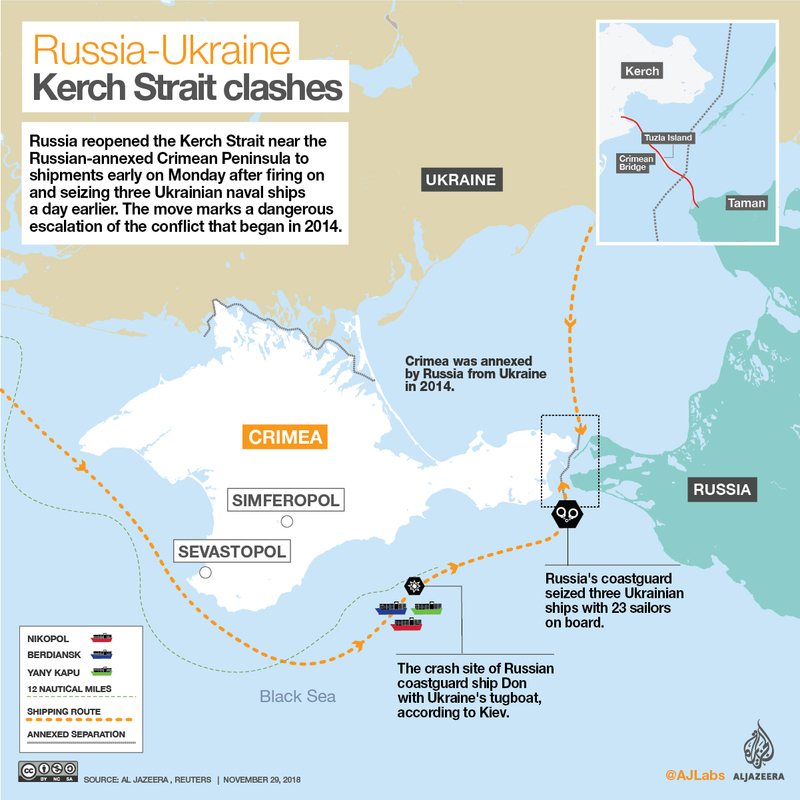 The tension between Ukraine and Russia reached new heights on Sunday after the Russian border patrol blocked three Ukrainian vessels travelling from the Black Sea to the Sea of Azov through the Kerch Strait – the shared waters of both states, according to a 2003 agreement. In a further escalation of the standoff, a Russian court in Crimea later ordered a 60-day pre-trial detention for the 24 Ukrainian crew members captured by Moscow during the standoff. According to their lawyers, the detainees were sent to Moscow on Thursday. Also on Thursday, Ukrainian authorities closed the administrative border with “temporarily occupied Crimea” for everyone except Ukrainian passport holders “in connection with the introduction of martial law“. Ukraine does not have military or diplomatic leverage against Russia to free the sailors – whom Moscow has called “prisoners of war” – or to end what Kiev calls the blockade of the Sea of Azov. However, it is unlikely that NATO, a military alliance that Ukraine is not a member of, would send naval vessels to the area “for the moment”, according to Oleksiy Melnyk, co-director of Razumkov Centre, a think-tank for foreign relations and international security in Kiev. “It would be perceived as a threat not only by the Russians but also by some of the NATO members,” he told Al Jazeera, pointing to the fact that NATO presence in the Black Sea is already seen as a red flag by Moscow. The Sea of Azov is shared between Ukraine and Russia, according to a 2003 accord which rules out any permanent presence of outside military forces there. Melnyk said Kiev and Moscow have the right to invite a foreign force in the area only “for a very limited time” and after advance notice to the other party. The nearby Russia-annexed Crimean peninsula is already highly militarised. On Thursday, Russia’s Tass news agency announced that Moscow has sent a fourth S400 surface-to-air missile system to the occupied territory. Ukraine considers it to be a threat not only to Kiev but to the whole Black Sea region. “The system’s operational range is up to 400km so it places all literal states in the Black Sea region, including NATO members, under the threat of an attack. We know that those missiles can be used also for ground targets,” Olexiy Makeyev, the Ukrainian foreign ministry’s political director, told Al Jazeera. The most realistic chance Ukraine has to secure the release of the sailors as well as regaining its share of the control over Kerch Strait is through diplomatic mediation. Turkey’s President Recep Tayyip Erdogan said on Thursday he had discussed the possibility of Turkish mediation with both sides. Igor Semyvolos, director of the Centre for Middle East Studies, an independent think-tank in Kiev, told Al Jazeera that Turkey already had a successful experience of mediation between the two states. “Turkey has already played a certain role in the release of Ukrainian citizens [two Crimean Tatar activists] from the occupied Crimea,” he said. However, the Kremlin has already rejected the idea of mediation. “Moscow is grateful to everyone who is ready to contribute to the de-escalation of tensions provoked by the Ukrainian side, but does not see the need for any mediation efforts,” Peskov said on Thursday after Erdogan’s comments. Oleksiy Haran, head of research at Ilko Kucheriv Democratic Initiatives Foundation, told Al Jazeera that Ukraine would not agree to go into negotiations with Russia without a third party. “Whenever we have bilateral talks, Russia violates it, says that ‘OK we haven’t discussed it’. There is no trust with Russia,” Haran said. Semyvolos told Al Jazeera that Moscow’s rejection of mediation means it “probably wants to use the standoff issue” in talks with the United States. Moscow has repeatedly accused the US of encouraging Kiev to stand strong against Russia.